The reporter arrived at the centrally located building on 23rd Street, where the CPI is headquartered, and was led to an office with two annoyed looking men. After bringing him coffee and talking about other things, they got to the point. They reproached the journalist for a report where he had referred to Cuba as « the communist Island. » This was a huge surprise to the correspondent because previous warnings he’d received were for « reporting only on the bad things about the Cuban reality, » or « not treating the leaders of the Revolution with respect. » But he never imagined that this time he would be scolded for the complete opposite. But yes, the censors who minutely examine the cables written by foreign agencies had not been at all pleased with the use of the adjective « communist » to characterize our country. « But the Communist Party governs here, right? » asked the incredulous reporter. « Yes, but you know the word looks bad, it doesn’t help us, » responded the higher-ranking official. The man stood there in shock for a few seconds while trying to comprehend what they were saying to him and think of a response other than laughing. The correspondent knew that annoying the CPI could bring more than just a slap on the wrist. Also in the hands of this institution is permission for foreign journalists to import a car, rent a house and–at that time–even to buy an air conditioner for their bedroom. The dilemma for the reporter was to give in and not write « the communist Island » any more, or to engage in conflict with the institution, where he had everything to lose. The mechanisms of control over the foreign press go far beyond warning calls from the CPI. Should a correspondent get married on the island, start a family in this land, his objectivity comes into doubt. The intelligence organs know how to pull the strings of fear to cause damage or pressure to a loved one. Thus, they manage to temper the level of criticism by these correspondents « settled » in Cuba. The perks are also an attractive carrot to keep them from touching on certain thorny issues in their articles. 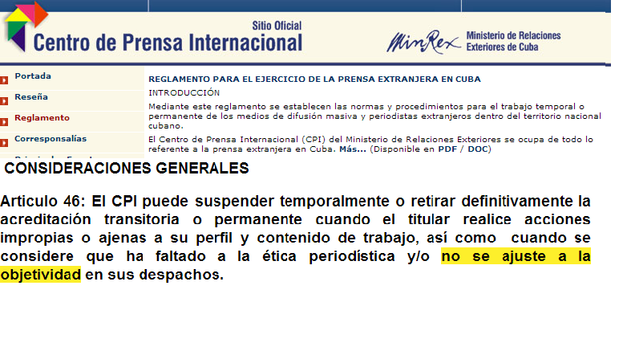 I know one foreign journalist who, every time she writes a press release about the Cuban dissidence, adds a paragraph where she declares, « the Government considers this opposition to be created and paid from Washington »… But her texts lack the phrase she could add to give the readers another point view, briefly communicating, « the Cuban dissidence considers the Island’s government a totalitarian dictatorship that has not been subjected to scrutiny at the ballot box. » This way, those who consult the press release could draw their own conclusions. Sadly, the objective of correspondents like her is not to inform, but to impose an opinion framework that is as stereotyped as it is false. Press agencies need to strengthen and carefully review their codes of ethics when dealing with Cuba. They should control the time their representatives spend on the island, because as the long years pass here emotional bonds are created that the regime can use for blackmail and pressure. An objective examination–every now and again–wouldn’t be a bad thing, given the possible coercion and Stockholm Syndrome their employees might suffer. The credibly of an information giant sometimes depends on whether a new imported car, or a beautiful young Cuban partner, is valued more than a commitment to journalism. Take care, foreign press agencies! Your representatives in these parts are always in danger of becoming hostages, first, and then collaborators, of the ruling regime.